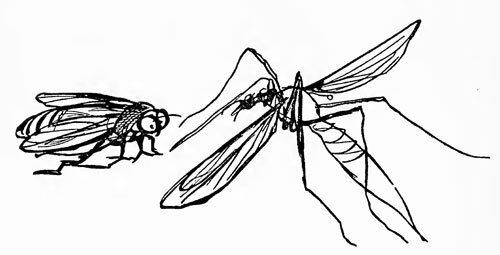 The Daddy Long-Legs and the Fly | Edward Lear: Two Hundred Years of Nonsense! "Why do you never come to court? I wish you'd tell me why. You'd quite delight the court. Why do you never go at all? I really think you ought. And, if you went, you'd see such sights! Such rugs and jugs and candle-lights! One in red, and one in green." You Fly, to come to court a bit!'" To hear you sing, 'Ah, Hum di Hum!'" Although it gives me pain. My legs are grown too long! I cannot sing one single bit!" And gazed upon the sky. They said, "This is a dreadful thing! The other much too long. Because his legs have grown too long!"